This Valentine’s Day say “I love you” to your kids with any one of these special DIY Valentines Day treats. Whether you want to put a nice surprise into your child’s lunchbox or if you just want to enjoy a special Valentine’s Day treat at home together as a snack, consider whipping up one any one (or more!) of these mom-tested and kid-approved Valentine’s Day goodies. Chocolate covered pretzels are easy to make and even the youngest kids can help out. Pick up a bag of traditionally shaped pretzel like Rold Gold Classics , mini pretzel or pretzel sticks, a bag of white chocolate chip, chocolate chips, and assorted sprinkles. You can add red food coloring to the white chocolate chips to up the festive factor if you would like. Melt the chocolate chips in the microwave for one minute, stir, dip the pretzels into the chocolate, add the sprinkles and lay the chocolate covered pretzels on a piece of wax paper to set. Tasty Valentine’s Day treats don’t have to include chocolate. Slice up strawberries and use small heart-shaped cookie cutters to cut kiwi, apples and pineapple into small hearts. Thread them onto skewers. Serve strawberry yogurt on the side as a fruit dip. Whether you make your own sugar cookies from scratch or pick up refrigerated dough at the grocery store, baking and frosting sugar cookies is a fun activity for the whole family. 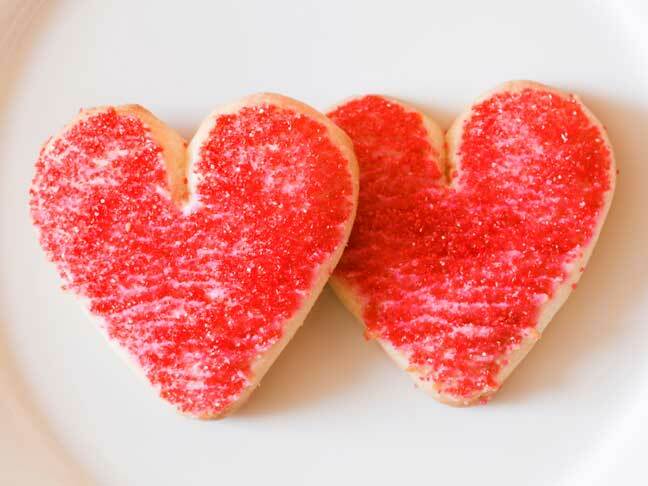 Use heart shaped cookie cutters to cut out the dough prior to baking. Frost baked cookies with white and pink frosting and top with assorted sprinkles. Follow the original Rice Krispies Treat recipe, but instead use berry flavored marshmallows or add red food coloring to the recipe. Form the treats into the shape of hearts using cookie cutters. If you’re looking for easy Valentine’s Day gifts, place heart-shaped treats into a plastic treat bag and use red and white curling ribbon to close shut. Prepare a boxed cake mix for cupcakes and just prior to baking, slide a marble down between the side of each cupcake liner and muffin pan. If you don’t have marbles, you can form pieces aluminum foil into tight balls. After the cupcakes have baked and formed, you can easily remove the marble or foil from the cupcake pan and you’ll end up with heart-shaped cupcakes to frost and enjoy! Do you have a special Valentine’s Day treat you serve up? Share your recipe or idea below.